There are two kinds of people in this world. Those who love the ‘Outlander’ TV series and Diana Gabaldon’s Outlander books. And – no, hang on. Surely there’s only one kind of people in this world? History. Big frocks. Tartan. Time travel. Massive dirks (be careful how you Google that). Really, I fail to see what is not to like. And if you are searching for that unique gift for someone special in your life, then I can tell you that you get huge Brownie points for arranging a Surprise Outlander Trip to Scotland. Be warned, there will be incredulous loud and repeated shrieking – possibly even tears – and it may seem to the general public that you are doing something Mean and Horrid to your beloved. But as in fact you are doing something undeniably Right and indeed Brilliant, you can put aside any natural reserve and soak up the glory. A few tips though, to help speed the way. Hide the SatNav, or at least pretend to be going to Edinburgh, which is exciting enough anyway for a surprise trip. Actually, you can get away with ‘Edinburgh’ as the answer to ‘where are we going?’ for ages, as most of the Outlander locations are all in the same rough direction. You could always blindfold the surpris-ee instead, if you don’t mind a motorway traffic cop chase and armed intervention. If your someone special is not English, do not go calling them ‘Sassenach’ as a term of endearment, as in Outlander. Schoolboy error, only rescued by the promise of an ‘Outlander’ T-shirt. Get to Doune Castle – Castle Leoch, Outlander fans! – before opening time. If you’re first in, you’ll get about 15 minutes on your own before the coach tours pile in. Midhope Castle – Lallybroch! I know! – is more complicated to visit, but is absolutely worth it, even the steep £10 to park the car outside what is essentially a ruin you can’t go inside. Of all the locations, Tibbermore Church – scene of the witch-trial in Season 1 – is probably the most atmospheric. Come here, and it’s good to know about the nearby Gloagburn Farm Shop which has an excellent café. If you’re looking to stay the night, you simply have to stop at the Covenanter Hotel in Falkland, which was used in the TV series. 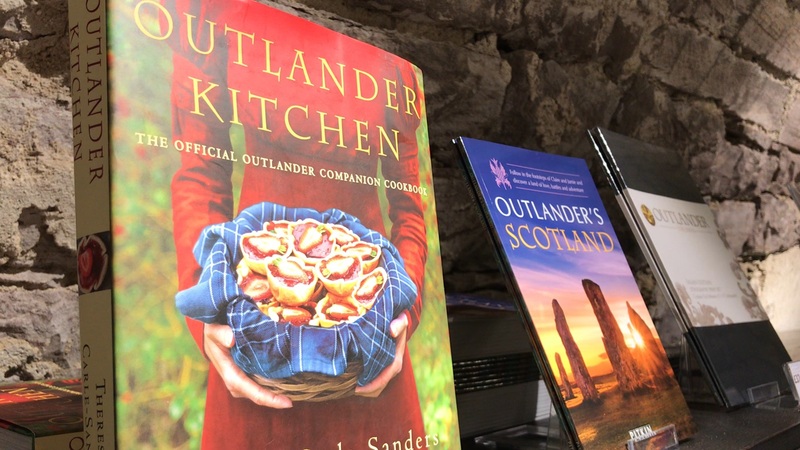 It’s charming and unpretentious, to the point that it doesn’t once mention its Outlander connections on its website or business cards, and I can’t quite decide if that’s bonkers or heroic. And for one final lunch recommendation, the Pillars of Hercules, a mile outside Falkland, is a rather quirky organic farm shop and café that’s one part Gilligan’s Island to two parts Scottish hipster. So I think we can safely say that I give good Surprise Trip. Let me know if you need any more tips Outlander fans – and the rest of you, get with the programme. Looks great – you obviously both had a fantastic time!! It was the brilliant organising, what can I say! And you can’t fail to enjoy yourself in Scotland – it’s so ridiculously scenic and atmospheric.